Download our infographic to see the pros and cons of various homogenizing methods. The word homogenize means "to make or render homogeneous" while homogeneous means "having the same composition, structure or character throughout". Homogenizing is what is called an umbrella word - a word which covers a very large area. When someone says that they are homogenizing, they may mean that they are actually doing one or more of the following, blending, mixing, disrupting, emulsifying, dispersing, stirring etc. Therefore, during this writing when the word homogenizing is used it may mean any one or more of the above-mentioned processes. The current processes or methods of homogenizing can be broken down into three (3) major categories, mechanical, ultrasonic and pressure. 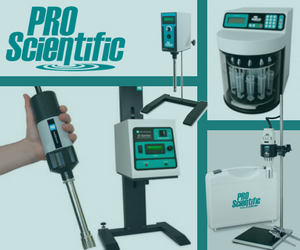 Click here to learn more about the full range of Rotor-Stator Homogenizers available from PRO Scientific including Package Kits, Hand-Held or Stand Mounted, Benchtop and Programmable Benchtop. Mechanical homogenizers can be broken down into three (3) separate categories, rotor-stator homogenizers, blade type homogenizers and bead homogenizers. Rotor-stator homogenizers - What is it? Rotor-stator homogenizers (also called colloid mills or Willems homogenizers) generally outperform cutting blade-type blenders and are well suited for plant and animal tissue. Combined with glass beads, the rotor-stator homogenizer has been successfully used to disrupt microorganisms. However, the homogenized sample is contaminated with minute glass and stainless steel particles and the abrasive wear to the rotor-stator homogenizer is unacceptably high. Cell disruption with the rotor-stator homogenizer involves hydraulic and mechanical shear as well as cavitation. Some people in the homogenizing field also claim that there is to a lesser extent high-energy sonic and ultrasonic pressure gradients involved. I personally do not believe in the theory that high-energy sonic and ultrasonic pressure gradients are involved with mechanical homogenizers. The only thing that ultrasonic and mechanical (rotor-stator) homogenizing have in common is that both methods generate and use to some degree cavitation. Cavitation is defined as the formation and collapse of low-pressure vapor cavities in a flowing liquid. Cavitation is generated as you move a solid object through a liquid at a high rate of speed. In ultrasonic homogenizing, the object being moved is the probe which is being vibrated at a very high rate of speed generating cavitation. In mechanical homogenizing (rotor-stator) the blade (rotor) is being moved through the liquid at a high rate of speed generating cavitation. Rotor-stator homogenizers - How does it work? The rotor-stator homogenizer or generator type homogenizer was first developed to make dispersions and emulsions, and most biological tissues are quickly and thoroughly homogenized with this apparatus. The appropriately sized cellular material is drawn up into the apparatus by a rapidly rotating rotor (blade) positioned within a static head or tube (stator) containing slots or holes. There the material is centrifugally thrown outward in a pump like fashion to exit through the slots or holes. Because the rotor (blade) turns at a very high rpm, the tissue is rapidly reduced in size by a combination of extreme turbulence, cavitation and scissor-like mechanical shearing occurring within the narrow gap between the rotor and the stator. Since most rotor-stator homogenizers have an open configuration, the product is repeatedly recirculated. The process is fast and depending on the toughness of the tissue sample, desired results will usually be obtained in 15-120 seconds. For the recovery of intracellular organelles or receptor site complexes, shorter times are used and the rotor speed is reduced. Rotor-stator homogenizers - What affects my results? Learn more about how these homogenizing factors affect what homogenizer your purchase and how you use your equipment, visit our "Homogenizing Selection Guide"
With mechanical, rotor-stator homogenizing the most important component is the homogenizer probe also known as the generator. The size of this precision crafter component can vary from the diameter of a pencil for 0.01-10ml sample volumes to much larger units having batch capacities up to 19,000 liters or, for in-line units, capabilities of 68,000 liters/hr. Rotor speeds vary from 3,000 rpm for large units to 8,000-60,000 rpm for the smaller units. In principle, the rotor speed of the homogenizer should be doubled for each halving of the rotor diameter. It is not the rpm's of the motor but the tip velocity of the rotor that is the important operating parameter. Other factors such as rotor-stator design, which there are many, materials used in construction, and ease of leaning are also important factors to consider in selecting a rotor stator homogenizer. Rotor-stator homogenizers - What size homogenizer is right for me? Laboratory size rotor-stator homogenizers process liquid samples in the 0.01 ml to a 20-liter range. The capacity of the rotor-stator should be matched to the viscosity and volume of the medium and with the type and amount of plant and animal tissue to be processed. The speed and efficiency of homogenization are greatly degraded by using too small a homogenizer, and the volume range over which a given homogenizer rotor stator size will function efficiently is only about 10 fold. Also, most of the laboratory-sized homogenizers function properly only with liquid samples in the low to medium viscosity range (<10,000 cps). This must be balanced against the practical observation that concentrated samples, by colliding more frequently, are broken up more rapidly. Higher viscosity samples can be processed but require specially shaped homogenization vessels or unique rotor-stator configurations. The size of the sample prior to processing with the homogenizer must be small enough to be drawn inside the stator. Therefore, samples often must be pre-chopped, cut or fragmented. Rotor-stator homogenizers - Special homogenizing concerns. There are no aerosols with in-line homogenizers. Even though a number of the laboratory rotor-stator homogenizers use sealed motors, none of them are truly explosion-proof. Due caution should be followed when using flammable organic solvents by conducting the homogenization in a well-ventilated hood. On the positive side, rotor-stator homogenizers generate minimal heat during operation and this can be easily dissipated by cooling the homogenization vessel in ice water during processing. The larger rotor-stator homogenizers are either scaled up versions of the laboratory models or in-line homogenizers. The latter contain teeth on the edge of a horizontally oriented, multi-bladed, high-speed impeller aligned in close tolerance to matching teeth in a static liner. Although less efficient than rotor-stator homogenizers, blade homogenizers (also called blenders) have been used for many years to produce fine brie and extracts from plant and animal tissue. The cutting blades on this class of homogenizer are either bottom or top driven and rotate at speeds of 6,000 to 50,000 rpm. Blenders are not suitable for disruption of microorganisms unless glass beads or other abrasives are added to the media and then one encounters the same problems as were mentioned above for rotor-stator homogenizers. Many plant tissue homogenizers undergo enzymatic browning which is a biochemical oxidation process which can complicate subsequent separation procedures. Enzymatic browning is minimized by carrying out the extraction in the absence of oxygen or in the presence of thiol compounds such as mercaptoethanol. Sometimes the addition of polyethyleneimine, metal chelators, or detergents such as Triton X-100 or Tween-80 also helps. Blade homogenizers are available for a range of liquid sample sizes from 0.01 ml to multi gallons. Some of the higher rpm homogenizers can reduce tissue samples to a consistent particulate size with distributions as small as 4um as determined by flow cytometric analysis. Accessories for some blenders include cooling jackets to control temperature and closed containers to minimize aerosol formation and entrainment of air. PRO Scientific has a complete line of Safety Sealed chambers which eliminates the aerosol problem as well as the problem of introducing air into the sample. One widely used method to disrupt cells is the ultrasonic disruption. These devices work by generating intense sonic pressure waves in a liquid media. The pressure waves cause streaming in the liquid and, under the right conditions, rapid formation of micro-bubbles which grow and coalesce until they reach their resonant size, vibrate violently, and eventually collapse. This phenomenon is called cavitation. The implosion of the vapor phase bubbles generates a shock wave with sufficient energy to break covalent bonds. Shear from the imploding cavitation bubbles as well as from eddying induced by the vibrating sonic transducer disrupt cells. Modem ultrasonic processors use piezoelectric generators made of lead zirconate titanate crystals. The vibrations are transmitted down a titanium metal horn or probe tuned to make the processor unit resonate at 15-25 kHz. The rated power of ultrasonic processors varies from 10 to 375 Watts. low power output does not necessarily mean that the cell disintegrator is less powerful because lower power transducers are generally matched to probes having smaller tips. It is the power density at the tip that counts. Higher output power is required to maintain the desired amplitude and intensity under conditions of increased load such as high viscosity or pressure. The larger the horn, the more power is required to drive it and the larger the volume of sample that can be processed. On the other hand, larger ultrasonic disintegrators generate considerable heat during operation and will necessitate aggressive external cooling of the sample. Typical maximum tip amplitudes are 30-250 urn and resultant output intensities are in the range of 200-2000 W/square cm. The temperature of the sample suspension should be as low as possible. In addition to addressing the usual concerns about temperature lability of proteins, low media temperatures promote high-intensity shock front propagation. So ideally, the temperature of the ultrasonicated fluid should be kept just above its freezing point. The ultrasonic disintegrator generates considerable heat during processing and this complicates matters. Disruption can also be enhanced by increased hydrostatic pressure (typically 15-60 psi) and increased viscosity, providing the ultrasonic processor has sufficient power to overcome the increased load demand and the associated sample heating problems can be solved. For microorganisms the addition of glass beads in the 0.05 to 0.5mm size range enhances cell disruption by focusing energy released by the bubble implosions and by physical crushing. Beads are almost essential for disruption of spores and yeast. A good ratio is one volume of beads to two volumes of liquid. Tough tissues such as skin and muscle should be macerated first in a blender or the like and confined to a small vessel during ultrasonic treatment. The tip should not be placed so shallowly in the vessel as to allow foaming. Antifoaming agents or other materials which lower surface tension should be avoided. Finally, one must keep in mind that free radicals are formed in ultrasonic processes and that they are capable of reading with biological material such as proteins, polysaccharides, or nucleic acids. Damage by oxidative free radicals can be minimized by including scavengers like cysteine, dithiothreitol, or other SH compounds in the media or by saturating the sample with a protective atmosphere of helium or hydrogen gas. For practical reasons, the tip diameter of ultrasonic horns cannot exceed about 3 inches. This sets a limit on the scale-up of these devices. While standard sized ultrasonic disrupters have been adapted to continuous operation by placing the probe tip in a chamber through which a stream of cells flow, cooling and free radical release present problems. High-pressure homogenizers have long been the best available means to mechanically disrupt nonfilamentous microorganisms on a large scale. Animal tissue also can be processed but the tissue must be pretreated with a blade blender, rotor-stator homogenizer, or paddle blender. The supremacy of high-pressure homogenizers for disruption of microorganisms is now being challenged by bead mill homogenizers. Still, in terms of throughput, the largest industrial models of high-pressure homogenizers outperform bead mills. The maximum volume of microbial suspension per hour that can be treated by the larger commercial machines is 4,500 liters for high-pressure homogenizers versus about 1,200 liters for bead mills. Even larger capacity high-pressure homogenizers are available but their efficiency in disrupting microbial cells has not been documented. This throughput advantage is diminished somewhat by the fact that most high-pressure homogenizers require several passes of the cell suspension to achieve high levels of cell disruption whereas bead mills frequently need only one. A familiar commercial high-pressure homogenizer for the laboratory is the French press which uses a motor-driven piston inside a steel cylinder to develop pressures up to 40,000 psi. Pressurized sample suspensions up to 35m1 are bled through a needle valve at a rate of about 1 ml/min. Because the process generates heat, the sample, piston, and cylinder are usually pre-cooled. Typical pressures used to disrupt yeast are 8,000 to 10,000 psi and several passes through the press may be required for high efficiency of disruption. Generally, the higher the pressure, the fewer the passes. Pressure cells rated at 20,000 psi maximum come in capacities of 3.7 and 35m1 and there is also a 35m1 capacity cell rated at 40,000 psi. Most high-pressure homogenizers used for homogenization were adapted from commercial equipment designed to produce emulsions and homogenates in the food and pharmaceutical industries. They combine high pressure with an impingement valve. Those with a maximum pressure rating of 10,000 psi rupture about 40% of the cells in a single pass, 60% on the second pass, and 85% after four passes. Capacities of continuous homogenizers vary from 55 to 4,500 liters/hr at 10-17% w/v cell concentrations. With the larger capacity machines, several passes are needed to achieve high yields of disruption. Considerable heat can be generated during operation of these homogenizers and therefore a heat exchanger attached to the outlet port is essential. What questions should you ask when choosing a homogenizer? Tissue Tearor, cell lysor, disperser, high shear mixer - what's the difference and why do I need it?